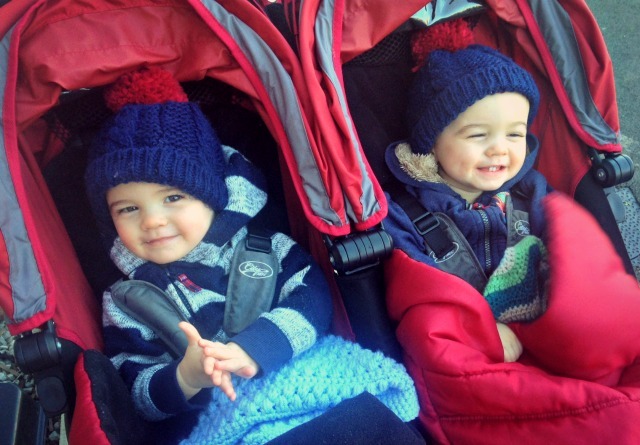 These boys make me laugh so much, they are so very happy but I think we’ve had a few grumpy weeks due to teething so it is nice to see the smiles back on their faces. I feel like they have grown up all of a sudden; they are understanding more and more and trying their very best to walk. They communicate with us in their own way and let us know what they do and don’t like, they’ll chase each other all over the house screeching and come up to us to give kisses and cuddles. They had a day with Nanny this weekend while we took Lucas to watch Octonauts Live and then we were all out at their cousins birthday party so it has been a fun-filled family weekend. I wasn’t very well this week so hadn’t taken many photos but this one was taken as we were on our way out to pick big brother up from school. This was the last school walk I managed for the week and the weather was so beautiful it was starting to feel like spring; I think walking in the sunshine has made us all feel happier. This photo never fails to make me smile, they look so full of mischief with those grins! A Cornish Mum aka Stevie! Oh my goodness look at those cute little faces!!!!! Such different personality showing here too! Aww those are some gorgeous smiles – and how big do they seem all of a sudden!! Ah gorgeous photo in the cold sunshine! They do look cheeky!